In 2015, over a billion people migrated: 244 million went abroad and 763 million moved within their home country. Some boarded planes to start a new job in another country. Some risked their lives in overcrowded boats, fleeing war or famine. And others left the countryside in search of jobs and a better quality of life. What the vast majority have in common is that they ended up moving to a city. 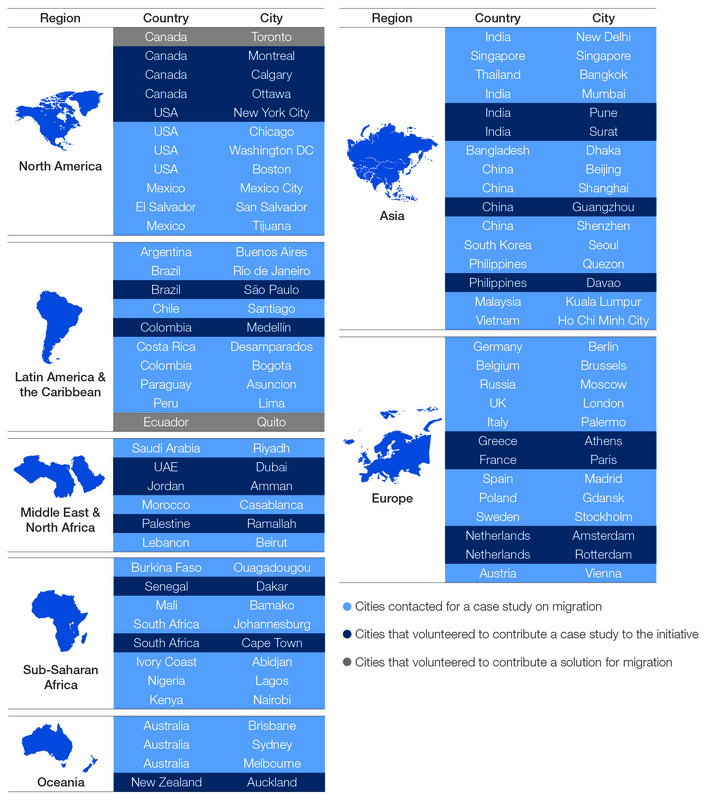 A new report by the World Economic Forum looks at these patterns of migration and how they affect the world’s cities. 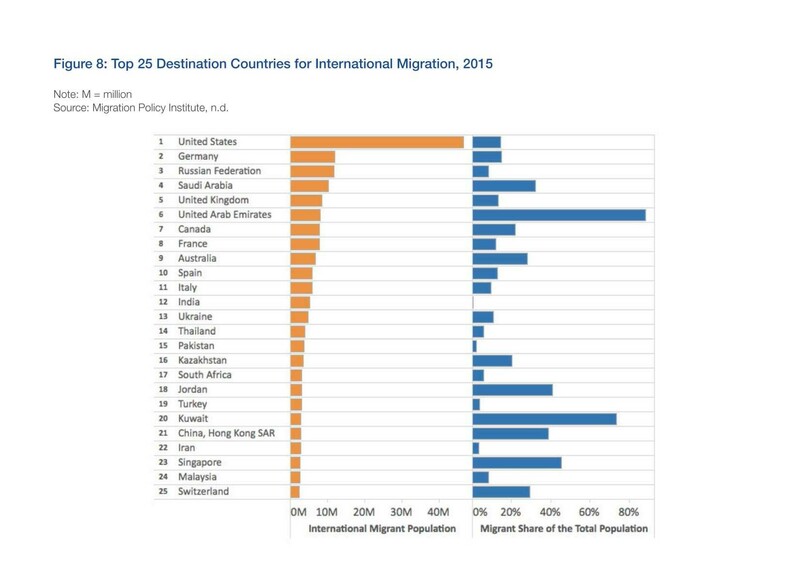 Where are migrants moving to? The numbers of migrants are growing. From 2000 to 2015 annual migration growth was 2.4%. This was double the annual population growth of 1.2%. Nearly one in five (19%) of the world's total migrants went to live in the United States. Germany and Russia together took in one in 10 (9.7%). However, when you look at the number of migrants as a proportion of the population, countries in the Middle East far outstrip any other. Over 80% of the population in the United Arab Emirates is foreign-born. Migrants tend to head to global cities. Dubai and Brussels have the highest number of foreign-born population at 83% and 62% respectively. Of the nearly 7 million foreign-born people living in Canada, almost half (46%) live in Toronto. Over one-third (36%) of Americans live in just 20 US cities. Those same cities are also home to two-thirds (65%) of the country’s authorized immigrants. In Australia, 6.6 million people were born overseas. Of those, 1.4 million live in Sydney and 1.2 million live in Melbourne. 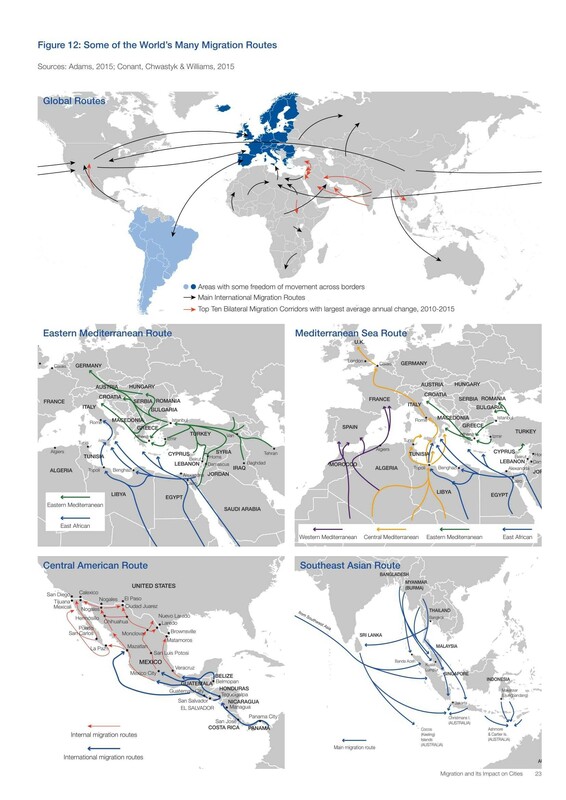 These maps show the world’s migration routes, both overland and sea. One map shows how people from East African countries cross the Mediterranean and hit the shores of Italy and Greece. Another shows the route via the Indian Ocean from south-west Asia into Malaysia. The maps in the middle show the routes taken by migrants from Iraq and Iran as they head into Turkey and Greece and from there into other parts of Europe. 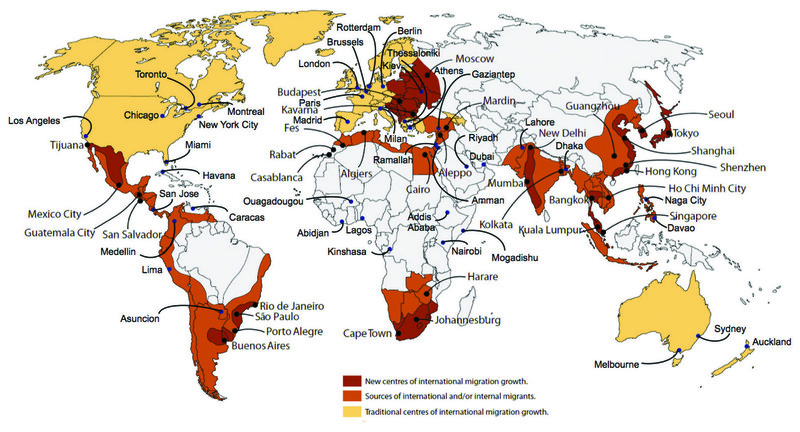 This map shows how patterns of migration are changing. Some areas have seen increased migration in recent years. Sao Paulo in Brazil, Moscow in Russia and Cape Town in South Africa are all cited as cities with a growing international population. Other areas have become both an origin, as well as a destination for migration. For instance, while Nigerians head into China, many Chinese are heading to the Middle East and Africa. Some cities, such as those in China, have seen rapid expansion in recent years, in part because of a huge increase in migration. Migration can have a positive effect on a country’s economy. But cities need to be prepared for the new arrivals if they are to harness the benefits. The World Economic Forum report looks at how 22 of the most affected cities around the world are coping with an influx of migrants. The four main challenges facing city chiefs identified in the report are: housing, health, education and employment. Almost all the cities reported a need for more affordable and social housing. This wasn’t only for migrants, but for the existing population too. For example, in Calgary, Canada, where 33.2% of the population are foreign-born, the waiting list for housing had reached 3,000 people. In addition, the average price of housing was higher in the city than the national average. However, in Surat, India, over 45,000 homes have been built in the last decade. This has decreased the proportion of the population living in slums from 17% in 2007, to 4.3% in 2017. The work is ongoing, with a further 10,200 housing units planned. Migrants need to be able to access healthcare that addresses their particular needs. Sixteen cities recognized that their healthcare services needed to be improved. Among them is Paris, a city where one in seven residents is a foreigner. However, the report says that Paris’ humanitarian centres for newcomers, which provide information and shelter, is an example to other cities of how to manage the arrival of migrants and help them integrate into their new communities. Education and employment are basic needs, but migrants often struggle to access both. Fifteen cities said that giving young migrants a primary and secondary education was a significant challenge. Eight of the 15 said that one of the biggest issues was migrants not speaking the language of their new city, and the challenge this posed to their successful integration. While access to employment and the labour market is a challenge in all cities, 11 of them cited employment-related issues that must be addressed. Six cities – Berlin, Rotterdam, Amman, Ramallah, Davao City and Cape Town – saw their growing rate of unemployment as a challenge. Amman and Cape Town were among the cities studied in the report with the highest unemployment rates. The report notes that fostering migrant entrepreneurship can help the local economy, and cities should provide training and mentoring support. The economic benefits of migration are clear. In 2015 migrants contributed over $6.4 trillion, or 9.4%, to global GDP. The UN’s Sustainable Development Goals recognize that well-managed migration will play an integral role in achieving sustainable development for cities. In addition, the report says that cities can learn from each other’s initiatives, and work even more closely together in the future. “Partnerships between cities will have greater prominence in the years to come, with possibilities of migrant redistribution and responding to labour market needs with immigrants,” said Gregory Hodkinson, Chairman of Arup. Alice Charles, who leads work on cities and urban development at the World Economic Forum, concluded: “We are living in an ever increasingly urban world, where migrants continue to be drawn to cities in search of economic, social and creative opportunities.